The .tmp file is nothing but the Temporary file or foo file, a temporary file is a file created to hold information temporarily while a file is being created. After the program has been closed, the temporary file should be deleted. Temporary files are used to help recover lost data if the program or computer is abnormally halted. 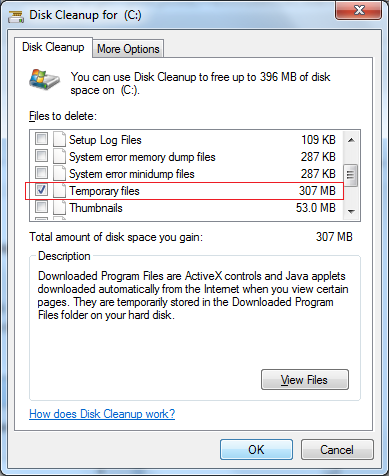 If you are using the operating system Windows 98 or later you can use Windows Disk Cleanup utility to delete temporary files and cleanup other portions of your computer. Windows Disk Cleanup utility first introduced with Microsoft Windows 98 and included in all future releases of Microsoft Windows that enables users to remove files that are no longer needed or that can be safely deleted. Follow the below steps to open the Microsoft Disk Cleanup. 3. 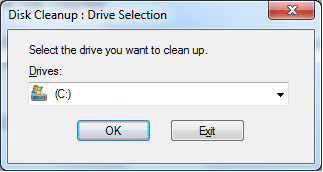 In System Tools, click Disk Cleanup then you could see the below dialog, select the Drive which you want clean up. 4.Once Disk Cleanup is open check the option Temporary file in Files to delete: section like shown on below image.To the right of each option you can see the disk drive space each of the items are taking on your hard drive. Note: We highly recommend that users DO NOT check the option to Compress old files. Often this option causes more issues than the small amount of space it recovers is worth. 5.Click OK to start the cleanup process.